The Portable, Modular, Customizable Avalon Mission Tracker. 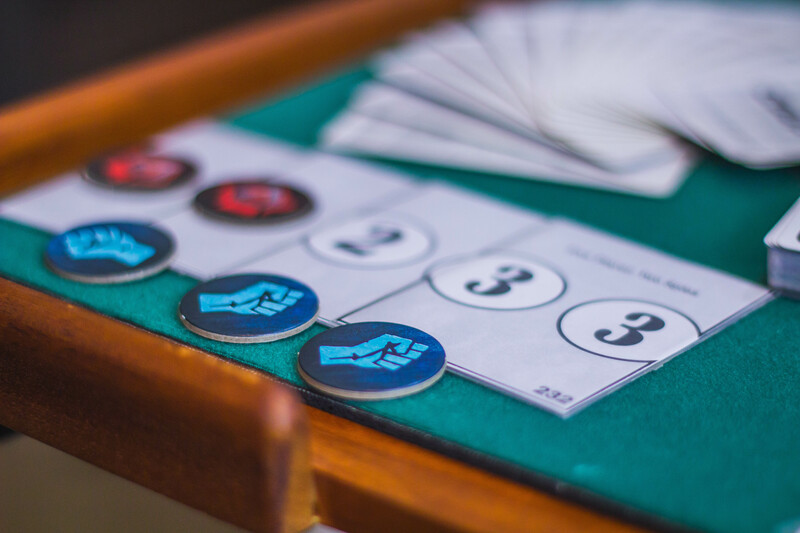 The PMCAMT (pithy title pending) is a set of four double-sided playing card-sized boards that, when combined, can form any of the six player boards needed to play The Resistance: Avalon. 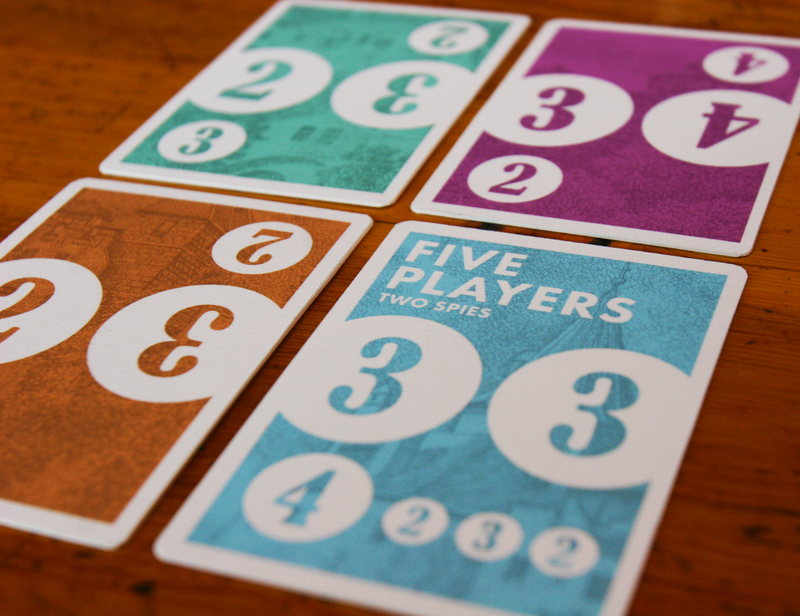 Each of the four card faces corresponds to a certain number of players (from five to ten), while the reverse of each holds every permutation of numbered spaces required to assemble the remainder of the board. 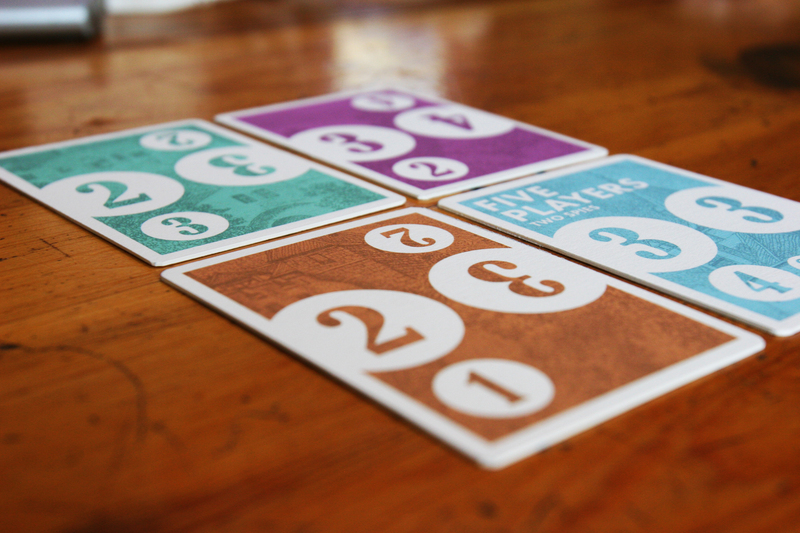 Find the card face that corresponds to the appropriate number of players. Turn the remaining cards over. 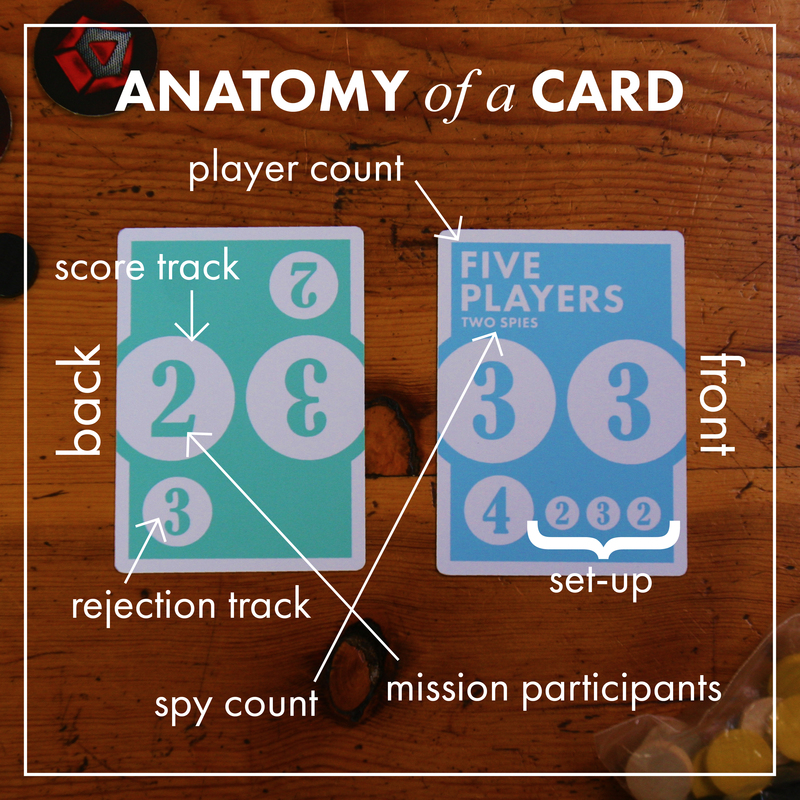 Find the three numbers that correspond to the set-up diagram in the lower right hand corner of the face card. 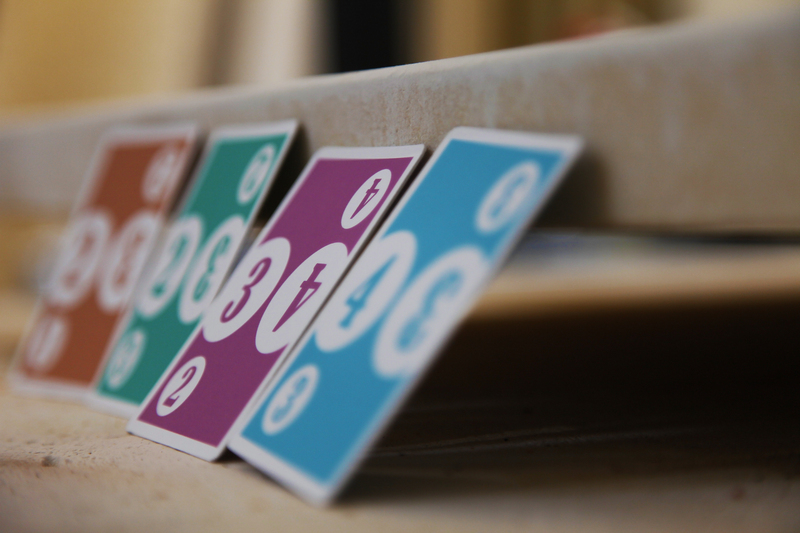 Overlap the cards to expose the correct numbers, making sure that the reject track falls in numerical order. 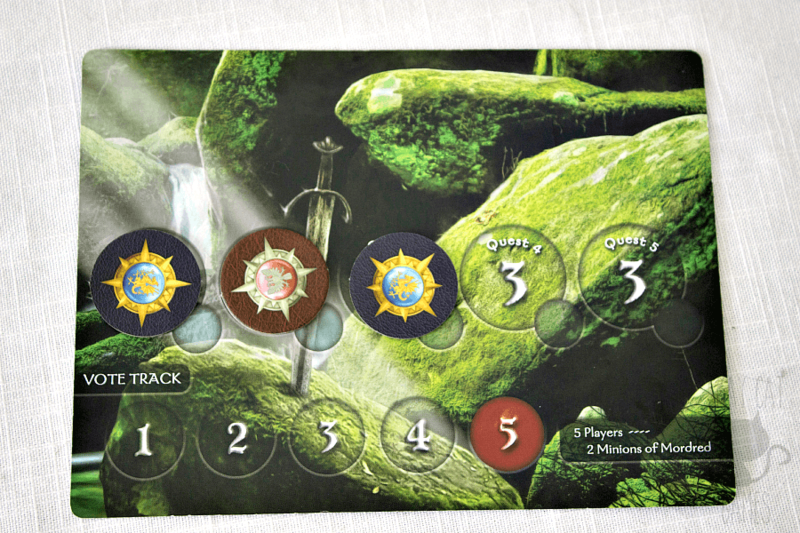 I recognized two things: first, the last two missions for every player count are unique from any other board; and, second, the remaining missions are comprised of permutations of one of three integers: One, Two, or Three. It was a convoluted process to figure out which numbers needed to be paired with which face. 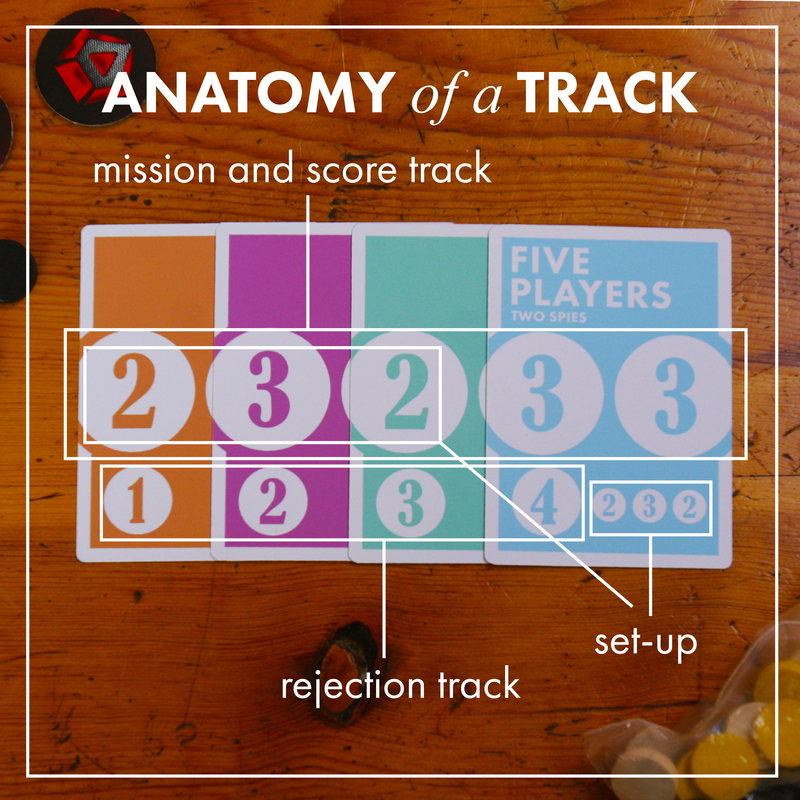 Using the same process of elimination I was able to perfect the design by incorporating the rejection tracker. With these discoveries, the meat of the cards fell directly into place. 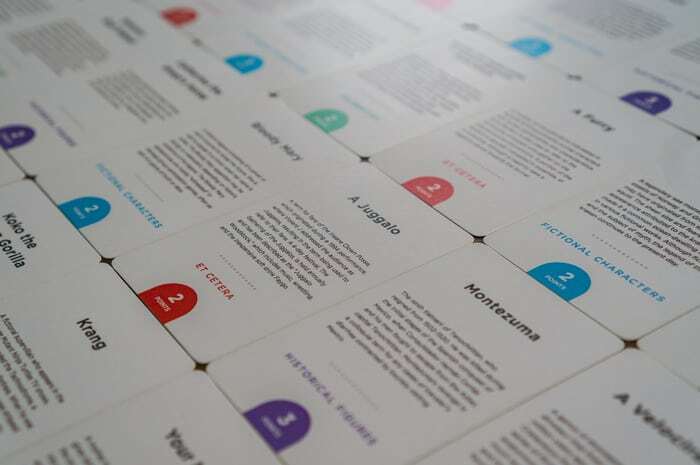 If you’d like to print your own set, download the links here. I printed mine on separate sheets of paper then hot-pressed them together. Enjoy! 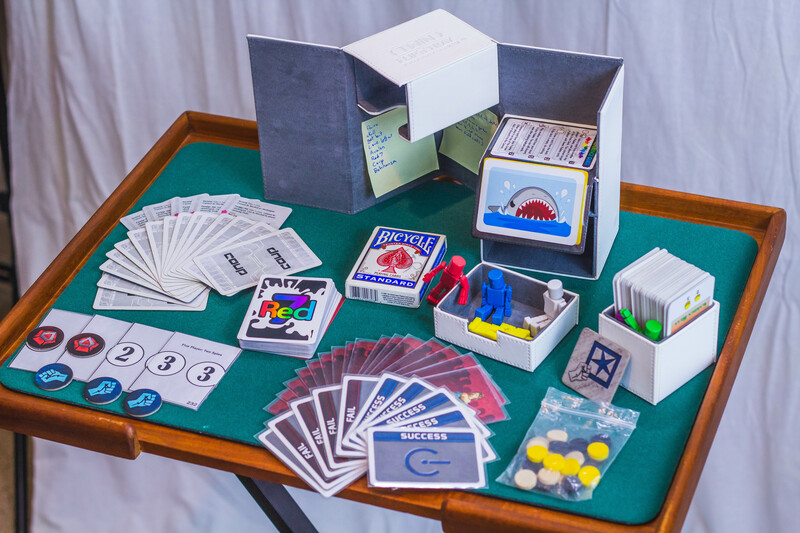 In writing this blog I am inspired by three things: my admiration for the fantastic board game journalism of Shut Up & Sit Down; the apt timing of my obsession’s upswing paired with the beginning of my year abroad; and lastly, my fascination with—and subsequent modification of—this game box as a way to efficiently unleash games. The latter is what I would like to dissect today. 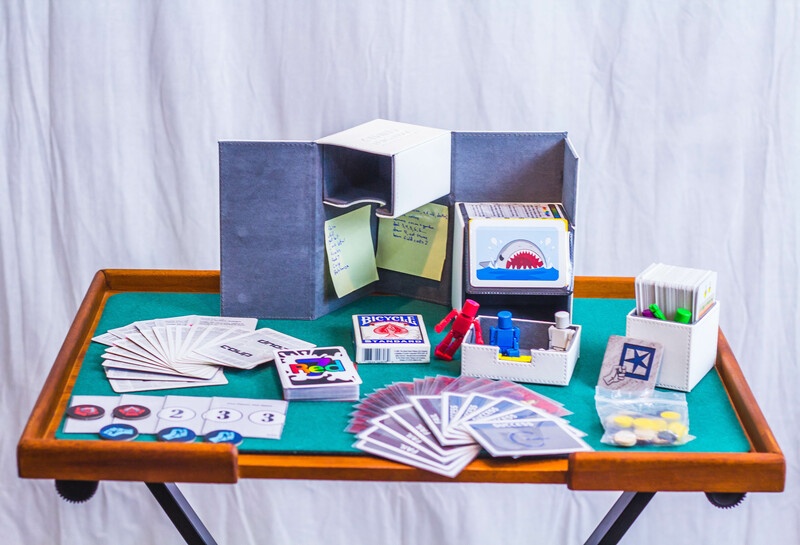 Brittanie Boe‘s original travel box is simple, varied, and accessible, but—as she points out at the end of her post—it suffers from one weakness: the untapped potential in component overlap. Her example—the lack of necessity in including Love Letter tokens when Council of Verona tokens could have served just as well—inspired me to take things a step further. My own design achieves component overlap in every way I can imagine, perhaps gratuitously. 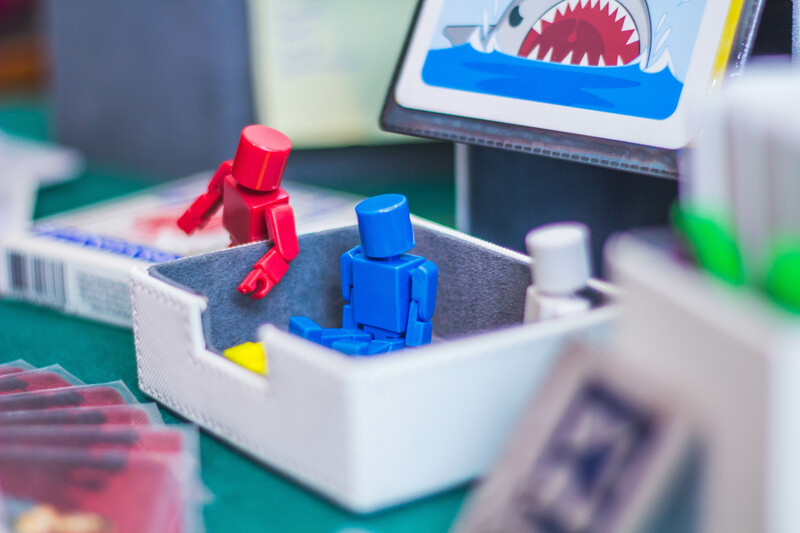 However, this attention to detail not only allowed me to fit an extra game, it allowed me to pack games with more components—and therefore, more depth—more efficiently. 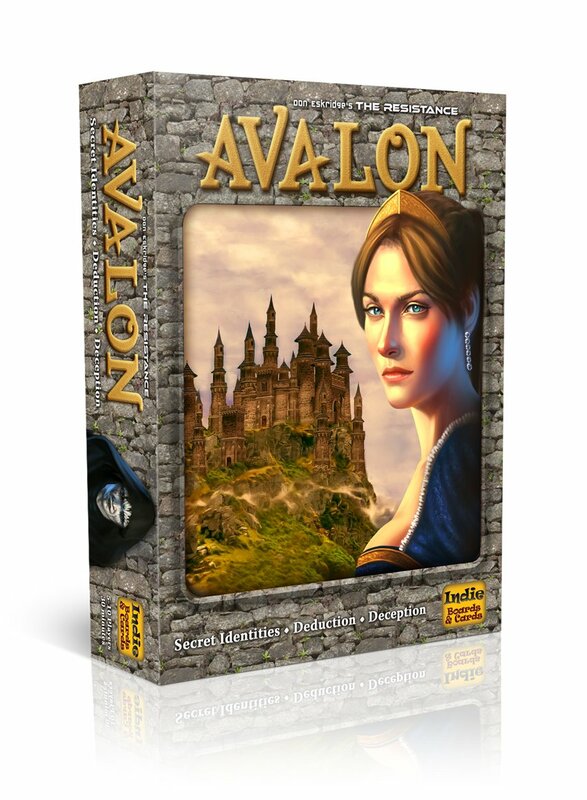 Avalon and Pairs are the progenitors of the box: they lend the majority of their components to other games. 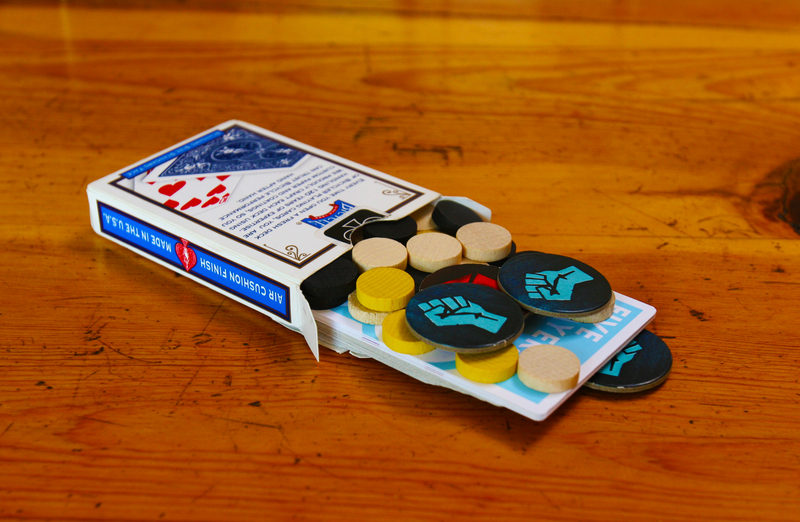 I’ve modified the Pairs deck, shown right, (which is triangular: 1xA, 2×2, 3×3, 4×4, etc.) to have all black sevens, each inscribed with a green skull. 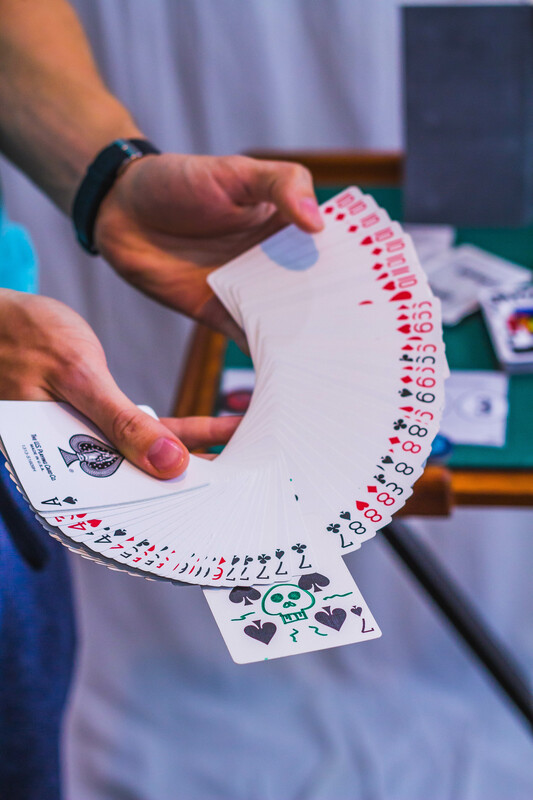 These, when combined with the plethora of red nines and tens, provides the ability to construct: 1) up to seven player’s worth of Skull hands, and 2) a variable number of role card sets for Avalon. I’m also quite proud of the efficient distillation of the Red7/Get Bit! combination. 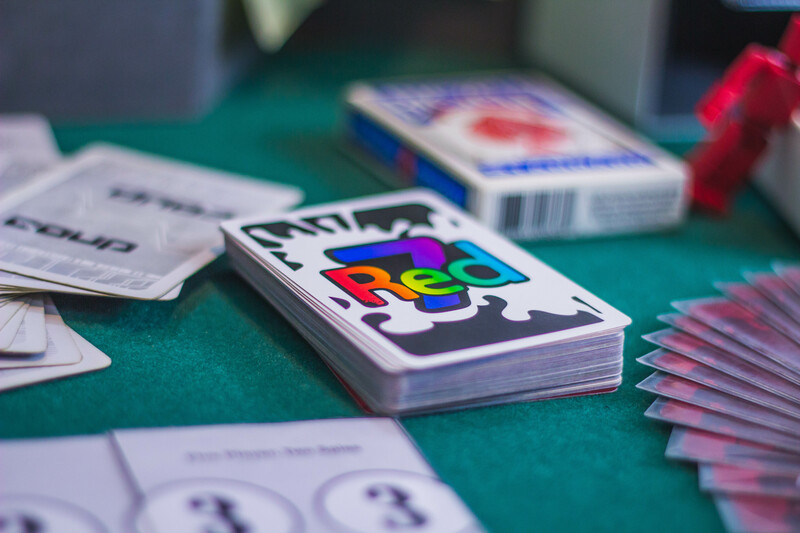 The Dismember-men find crannies to sleep throughout the box, and their original cards are replaced perfectly by those found in the Red7 deck. Bohnanza is the only stand-alone game. It could have been replaced by any number of ~100 card-decked games: Innovation, Sushi Go!, Star Realms, etc. 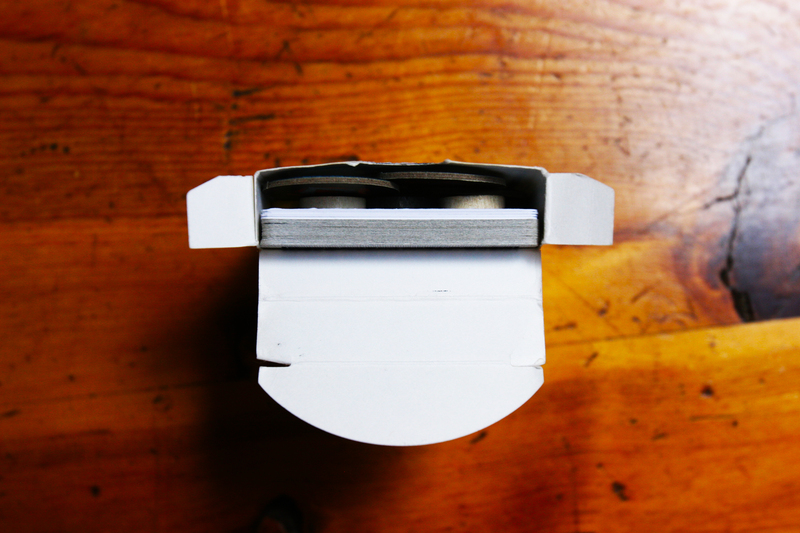 There are two innate secrets hidden within the Twin Flip’n’Tray Box that I uncovered during my exploration of it. 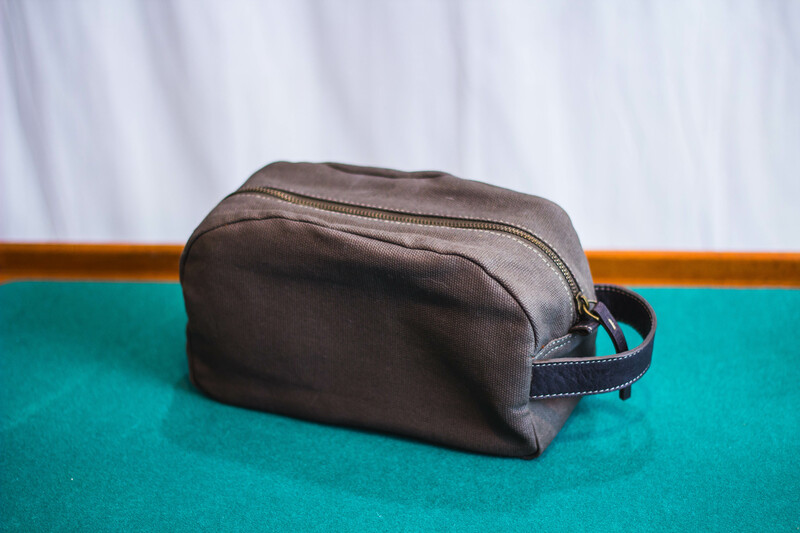 Both are simply ways to fill the air pockets—inherent to the box’s design—with useful odds and ends. 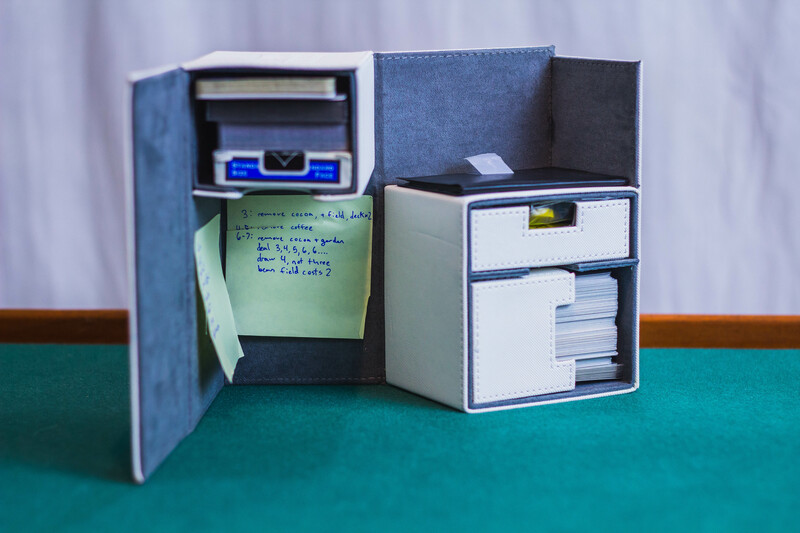 First, the numerous places for post-it notes: I have found four areas where, if deemed appropriate, the user might adhere a number of post-it notes. 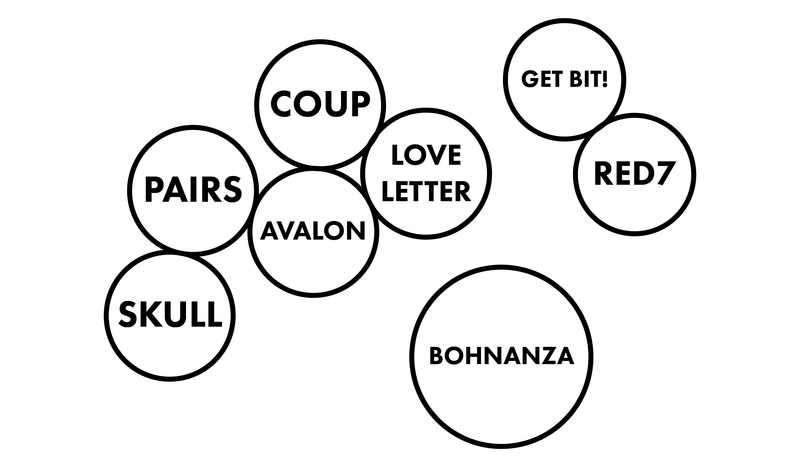 The user can use these as a means to keep score, or, as I have chosen to do so above, as a cheat sheet for games with player number dependent variable setups, such as Bohnanza. 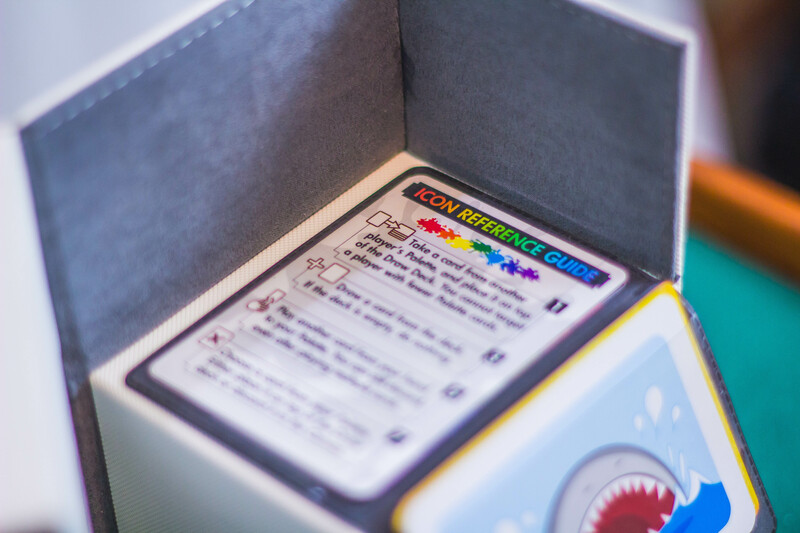 On the other post-it is a list of the eight games housed in the box. The second secret is pictured above and to the right. 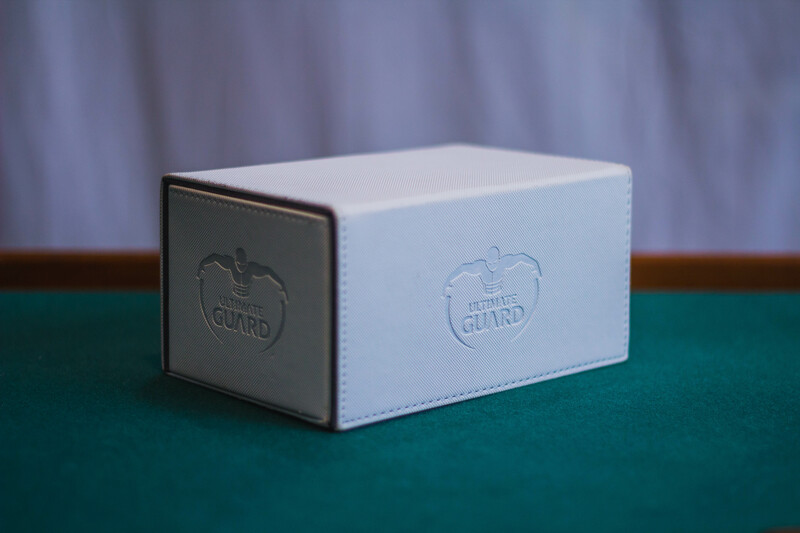 The two swivel compartments in the box come together to create a sliver of negative space between them, broad enough to house ten or so cards. I built upon this by gluing a cheap magician’s card wallet to the top of the drawer section. This provided me with a simple and fast way to access the reference cards for both Love Letter and Red7, as well as the Get Bit! shark card. 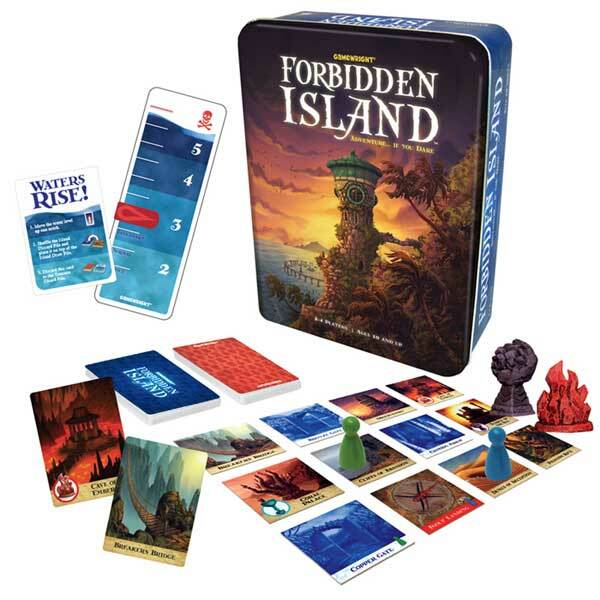 I believe this to be a worthwhile evolution upon Bebo’s original #travelgamebox, an example of the individualization possible within the limits of the medium. To leave the door open as Bebo did, I will say that this box could be optimized to sit at any point on the scale between content and efficiency. I do not claim to have the most efficient box ever, nor do I claim that my box has the best games ever. My only hope is that some lost soul will pick up this idea where I left off and create something even grander. 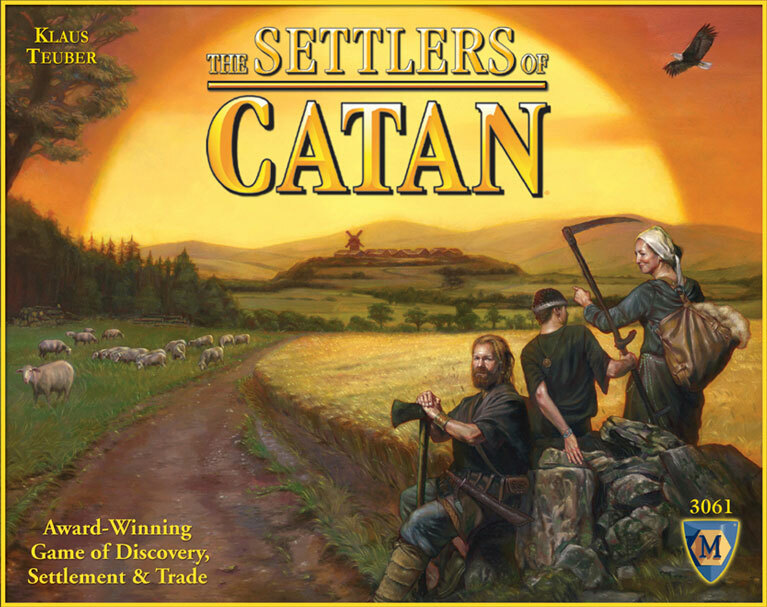 My name is Caleb, and I’m addicted to board games. I realize this claim is trite, but I mean it, with all it’s implications: no other phrase could explain the suffocating bleakness I feel when starved of new material; the tumultuous rise and fall of my pulsing need; the intolerable want, sated only by the purchase of another incremental stone along my hopeless path to finding a better—easier, denser, fresher, truer, grander, newer—jumble of cubes and rules and boards and cards to unleash, unforgiving, upon my friends and family. I hope, with this blog, to find a justification spending so much of my limited everything on this, my least lucrative of hobbies. The quest begins at the end of my senior-year summer. Goaded on by guilt, horror stories, and unadulterated apathy I have chosen to postpone college in favor of a gap year, a portion of which will be spent abroad in the most remote of continents: Australia. But first, a test-run foray: a month with my Grandmother, Judy Tuwaletstiwa.